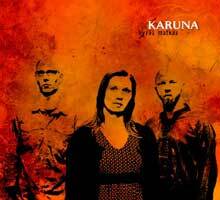 Karuna perform new Finnish folk music primarily with three keyboard instruments: nyckelharpa, piano) and accordion. The music on Hyvää matkaa (bon voyage) consists of original tunes strongly influenced by Scandinavian folk music, but given a thoroughly modern reading. About the musicians: Esko Järvelä is a fourth generation folk musician and one of the most-known folk fiddle players in Finland. He plays in bands such as Frigg, Es&Co, Baltic Crossing, Tsuumi Sound System and Tötterssön. Juha Kujanpää is a composer and musician interested in the area between European jazz and folk music. Besides Karuna, he is composing for his own bands Poutaja and Kirjava Lintu, and plays piano and reed organ also in Ville Ojanen Band, Captain Cougar, Kuha and Saarikorpi Brom. Teija Niku is an accordion player graduated from the folk music department of Sibelius Academy. Besides Scandinavian folk music, she has also specialised in the music of the Balkan area. You can hear her playing also in the bands Grupa Balkan and Polka Chicks. All contents of these web pages ©2001-2007 FNI Multimedia / cdRoots unless otherwise stated.